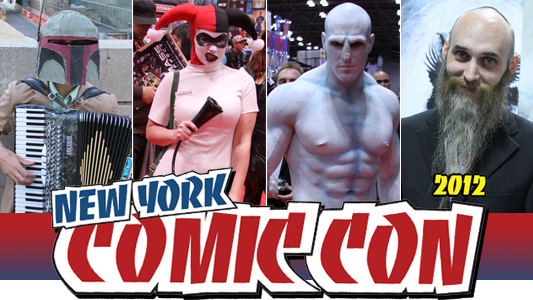 New York Comic-Con, the gathering of all things geek, sci-fi/fantasy, comic books, and action figures, has hit the East Coast, as the Jacob Javits Center in New York City is hosting the convention all weekend. You can see our photos of Friday night’s coverage here below. While certainly not as big as the convention held annually in San Diego (which is generally considered the archetype mecca of geek conventions), the NYCC has its share of zealous minions who congregate in the large glass and steel edifice that is the Javits Center, milling and moiling around its carpeted floors, checking out its voluminous amount of booths filled with sci-fi/fantasy arcana, figurines, T-shirts, original and reproduced artwork, comics books dating back to the Silver Age, and the artists, writers, and creators of said minutiae. But without question, one of the coolest appeals of the entire convention has to be the scores of fanboys and fangirls, just regular Joes and Janes, decked out in costumes of their favorite superheroes, ranging from dollar store versions to authentic, mindblowing replicas of the genuine articles.